Raumfahrt+Astronomie-Blog von CENAP - Blog: Astronomie - Was ist auf der Oberfläche eines Schwarzen Lochs? Are black holes the ruthless killers we've made them out to be? Samir Mathur says no. According to the professor of physics at The Ohio State University, the recently proposed idea that black holes have "firewalls" that destroy all they touch has a loophole. In a paper posted online to the arXiv preprint server [arXiv:1506.04342], Mathur takes issue with the firewall theory, and proves mathematically that black holes are not necessarily arbiters of doom. In fact, he says the world could be captured by a black hole, and we wouldn't even notice. More than a decade ago, Mathur used the principles of string theory to show that black holes are actually tangled-up balls of cosmic strings. His "fuzzball theory" helped resolve certain contradictions in how physicists think of black holes. But when a group of researchers recently tried to build on Mathur's theory, they concluded that the surface of the fuzzball was actually a firewall. According to the firewall theory, the surface of the fuzzball is deadly. In fact, the idea is called the firewall theory because it suggests that a very literal fiery death awaits anything that touches it. Mathur and his team have been expanding on their fuzzball theory, too, and they've come to a completely different conclusion. They see black holes not as killers, but rather as benign copy machines of a sort. They believe that when material touches the surface of a black hole, it becomes a hologram, a near-perfect copy of itself that continues to exist just as before. "Near-perfect" is the point of contention. There is a hypothesis in physics called complementarity, which was first proposed by Stanford University physicist Leonard Susskind in 1993. Complementarity requires that any such hologram created by a black hole be a perfect copy of the original. Mathematically, physicists on both sides of this new fuzzball-firewall debate have concluded that strict complementarity is not possible; That is to say, a perfect hologram can't form on the surface of a black hole. Proponents of the firewall theory take an all-or-nothing approach to complementarity. Without perfection, they say, there can only be fiery death. With his latest paper, Mathur counters that he and his colleagues have now proven mathematically that modified complementarity is possible. It's not that the firewall proponents made some kind of math error, he added. The two sides based their calculations on different assumptions, so they got different answers. One group rejects the idea of imperfection in this particular case, and the other does not. Imperfection is common topic in cosmology. Physicist Stephen Hawking has famously said that the universe was imperfect from the very first moments of its existence. Without an imperfect scattering of the material created in the Big Bang, gravity would not have been able to draw together the atoms that make up galaxies, stars, the planets--and us. "There's no such thing as a perfect black hole, because every black hole is different," Mathur explained. His comment refers to the resolution of the "information paradox," a long-running physics debate in which Hawking eventually conceded that the material that falls into a black hole isn't destroyed, but rather becomes part of the black hole. The black hole is permanently changed by the new addition. It's as if, metaphorically speaking, a new gene sequence has been spliced into its DNA. That means every black hole is a unique product of the material that happens to come across it. The information paradox was resolved in part due to Mathur's development of the fuzzball theory in 2003. The idea, which he published in the journal Nuclear Physics B in 2004, was solidified through the work of other scientists including Oleg Lunin of SUNY Albany, Stefano Giusto of the University of Padova, Iosif Bena of CEA-Saclay, and Nick Warner of the University of Southern California. Mathur's co-authors included then-students Borun Chowdhury (now a postdoctoral researcher at Arizona State University), and Steven Avery (now a postdoctoral researcher at Brown University). Their model was radical at the time, since it suggested that black holes had a defined--albeit "fuzzy"--surface. That means material doesn't actually fall into black holes so much as it falls onto them. The implications of the fuzzball-firewall issue are profound. One of the tenets of string theory is that our three-dimensional existence--four-dimensional if you count time--might actually be a hologram on a surface that exists in many more dimensions. 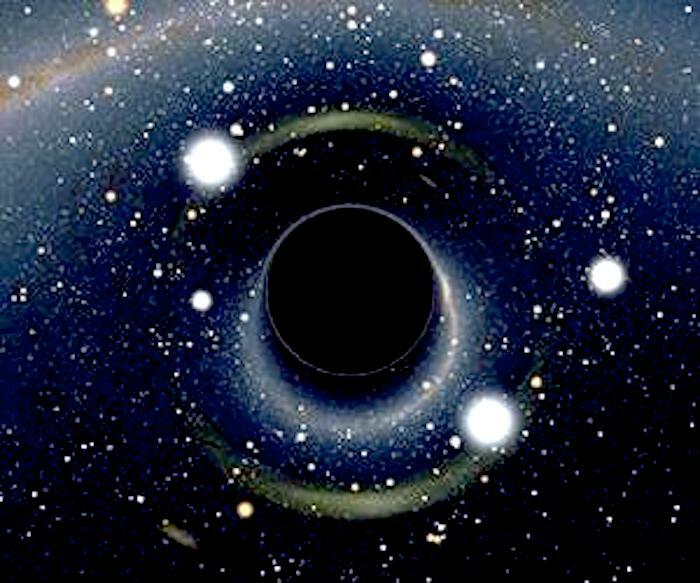 "If the surface of a black hole is a firewall, then the idea of the universe as a hologram has to be wrong," Mathur said. The very nature of the universe is at stake, but don't expect rival physicists to come to blows about it. "It's not that kind of disagreement," Mathur laughed. "It's a simple question, really. Do you accept the idea of imperfection, or do you not?"